Re-committing to sharing my knowledge this year. Creating lasting, quality tools at work, for friends, and even strangers to guide them through tough technology concepts. Send friendly e-mails to friends and colleagues when I come across a helpful tool. Be open to receiving questions via e-mail and archive the responses. The time spent helping this person can likely help others. Find an opportunity to volunteer, whether it be one time, once every couple of months or regularly. Look for organizations that could benefit from my strengths. Encourage and compliment daily. It is so easy to complain or discourage, this stuff takes time, but makes a lasting difference. First step: Looking over Mint.com and inspecting & accepting what's been spent and where. That can't be changed, but new habits CAN be started. I work hard to earn a paycheck and that money should work just as hard to create a wonderful and comfortable life for our family. First step: Signing up and committing to the Love Your Body Challenge over at Tone It Up. I love that this isn't just about be fitting, but truly loving your body and boosting self-confidence. First step: Committing to taking Spanish this next semester, accepting that taking just one class is okay and awesome! I can always take a math class in the future. This is about making progress. I love this song! Always make me feel happy and a great reminder to live each day to its fullest! 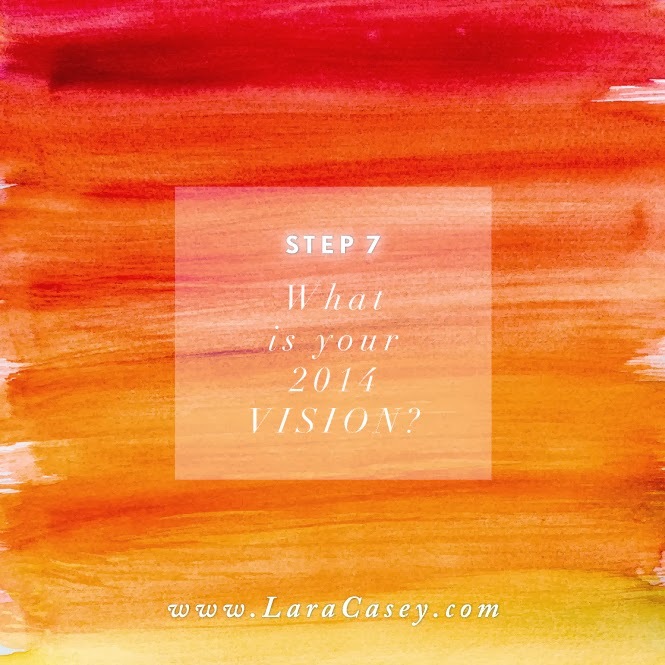 If you'd like to participate in "Making Things Happen in 2014," check out Lara Casey's blog here! When blogging or posting on social media, be sure to include the hashtag #makeithappen2014, so everyone can follow along! Where do you want to be when you're 80? When I look back on my life at 80, I want to be able to say that I've never stopped going on adventures, faced change and challenges with an open mind, and made an effort to enjoy and appreciate every day! I'd like to reflect back on my career and be proud of the work that I was able to accomplish and of the people I helped. I want to be able to say that I've developed a "honed" skill set and have a portfolio of projects that have challenged me and celebrate their success. I want to to be able to say that I have a loving and strong relationship with my husband and family. Last but not least, that I've valued memories and experiences over material goods. My word for 2014: PROGRESS! There are 365 days in a year to move close to your goals, make each one of them count! 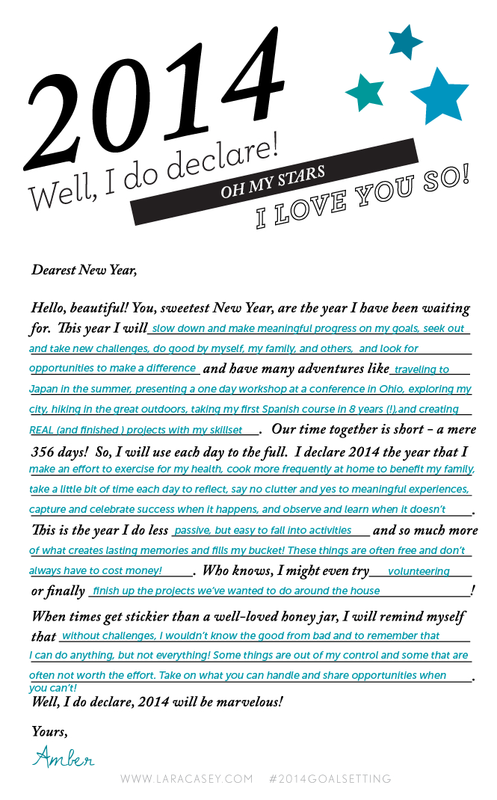 Making Things Happen: A Letter to 2014! I love taking the time to get outside on weekends, especially going hiking with my husband and our dog. It's funny that an activity that is essentially free can give so much! Sitting here in the cold of winter, I realize how important it is to take advantage of those longer, warmer days. I'd like to start going outside more in the evenings after work or even just taking a 30 minute stroll on the Greenbelt during my lunch break. Looking back on the list of things that worked, 98% of them do not like back to material objects, but rather to experiences! I think this is definitely telling me something! Spending time with family, friends, and learning things on my own is what sticks out most from this past year. That blouse or knick-knack? Not so much. I can accomplish big things! It's easy to be hard on myself or get frustrated when things don't get done-- but looking at this list, it is impressive as to what I have been able to accomplish! This is the stuff that matters, the things that should be celebrated, and at the end of the day, push me forward. It's important to put more focus on my husband and I's health. Eating out is not only financially expensive, it is expensive in other ways as well. When we eat out, this food is usually eaten quickly and doesn't give us a chance to come together and talk about what is going on in our day. Not to mention, it is also much less healthier than cooking at home. Does this mean we should give up eating out completely? No, but I think it should be done in moderation and be reserved for a treat, not convenience. Exercise and waking up early are two things I do really well when I have someone or something holding me accountable, or in many cases, literally waiting for me! But I realize that my health shouldn't have to depend on others. I need to reflect upon how I can integrate this stuff in my schedule for me! I've created a Pinterest Board bursting with items that make me feel full, energetic, positive, passionate, and make me want to accomplish BIG things! Check it out here! Here's to making the things you want happen! I'm so excited to begin sharing this series with you today! I stumbled upon Lara Casey's site a few months a go and feel like she gave me the "kick in the pants" that I really needed! This series is all about goal setting for the New Year and making those goals happen! Initially, I was hesitant to post these online, but I'm hoping that it will help to make me more accountable! Today I am feeling excited for the New Year, but also overwhelmed! Overwhelmed by the amount of stuff that I have accumulated, and overwhelmed by the things I want to accomplish! I have big aspirations, but know the road to them will never be easy! I need to slow down and break things down into manageable steps. Balancing time. There is plenty of time to get things done, but when works best? Should I spread chores out, or do them on weekends? Workout in the morning or night? How do I make thing things into habits? Breaking down long-term goals into short ones that are actionable. I know what I'd like to happen, now how do I get there?! Let's be honest, it can be SCARY! What do I need to lead a full life? How can I save the money I'd spend on material objects and use that to create meaningful experiences? A warm house and the things I need for our family to lead a comfortable life. A job that provides the opportunity for me to grow as a person! I'm also so grateful to have a regular work schedule for the first time in my life. Great, supportive people & love in my life- my husband, my dog, my family & friends. Step One: What WORKED in 2013? What good things happened in 2013? I managed to fill a few notebook pages looking back on the last year. This exercise was so meaningful to me, I had honestly forgotten about things like my college graduation and just how lucky I was to take several trips. Began my last semester of my Master's degree and walked at the commencement ceremony in May! Proposed my first conference presentation, received acceptance, and presented in June. Moved offices 2 times! Started in a wonderful new position on the last day of October. Celebrated our first wedding anniversary with a fun adventure in McCall, Idaho. Began hiking regularly on weekends with my dog, Greta. Explored the Farmer's market most weekends when it was open this year, trying new fruits and veggies and taking up some serious baking. Step Two: What didn't work well this year in life and at work? For years I've envied the seemingly effortless swooshes and flourishes found on handmade wedding invitations and in stylized posts from sites like BHLDN and Anthropologie. Browsing through the pages of catalogs and daydreaming over fonts filled with glorious glyphs (or letter alternates), I often thought to myself, could a girl known for her messy chicken scratch actually produce (and procure the patience for) beautiful type? After browsing through the latest list of Skillshare courses, I stumbled upon the work of Molly Suber Thorpe, creator of Plurabelle Calligraphy. 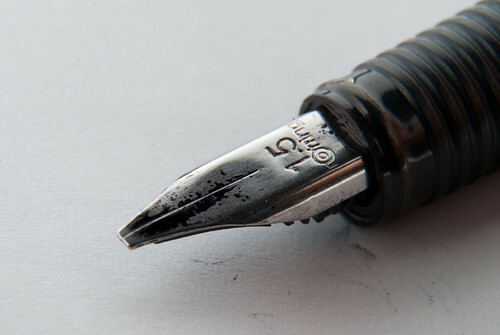 If such as thing as "ink ninja" were to exist, I'm pretty sure Molly would be a pointed-pen yielding master. 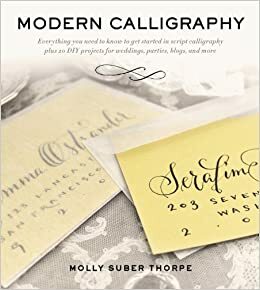 And better yet, she's wrote a book on the subject as well, Modern Calligraphy: Everything You Need to Know to Get Started in Script Calligraphy . I Still Love You Calligraphy I met Melissa during ALT Summit and was smitten with her lovely handwriting! She offers a website-based calligraphy courses for all beginner and intermediate learners. Molly Jacques Illustration Beautiful, fresh designs and her chalkboard lettering makes me want to open up a little café, just so I could have her craft the menu board! While I wasn't necessarily planning to take the whole month of August off from blogging, time seemed to have zipped by in the blink of an eye! August was full of projects and new experiences; I had the opportunity to be a second shooter for a wedding, hosted a photobooth for my Dad's company picnic and learned even more about Illustrator thanks to Nicole's Classes! I just started my second to last semester of Grad School and couldn't be more excited to work through what I have left and delve deeper into instructional design. Oh, and did I mention that our wedding is now less than 41 days! Wow-wee! I can't believe that it was just 9 months ago since I said "yes!" to my best friend. This month on the blog will likely be filled with more photos and planning, I want to commit to more regular posts, but that will probably have to be post-wedding! Here's the link to our photobooth gallery if you'd like to see! Here's to a productive September and savoring the last bits of Summer! 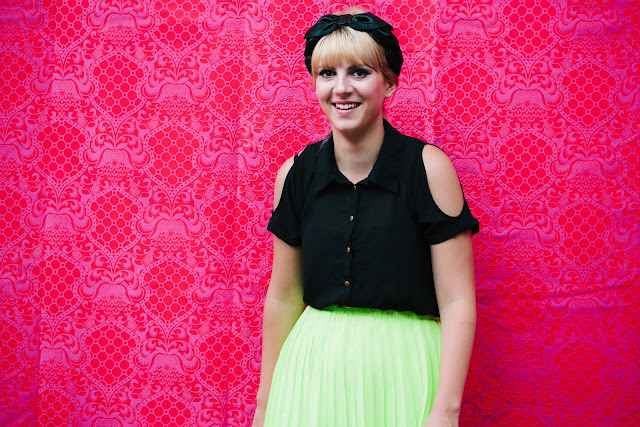 My super cute sis at our photobooth!